If you like creating pesto sauce, then you know you need basil. As one of the ingredients, it is an herb perfect for growing in warm weather. Growing basil requires planting its seeds or transplants right after the winter’s end. That is when the soil is warm, and you can harvest more abundantly in just a matter of weeks. Basil is an annual herb. It has a Latin name called Ocimum basilicum. Although seasons besides winter are the best times to grow basil plants, there are some exceptions. Growing basil indoors during winter works wonders too. This is for those who wish to have more of them all year round. Purple basil, which is not as sweet as the regular, common one. Lemon basil, which of course tastes more like lemon. Thai basil, which has a licorice-like flavor. Cinnamon basil, which has purple flowers too and tastes rather spicy. When it comes to dealing with basil plants, there are some ways to grow them properly. If you consider making your pesto sauce, you can start with several plants. Growing basil helps if the temperature is between 50 F (at night) to above 70 F (during the day). A sunny, sheltered spot works wonders as the location. Make sure that spot is away from chilly winds and extreme temperature changes. 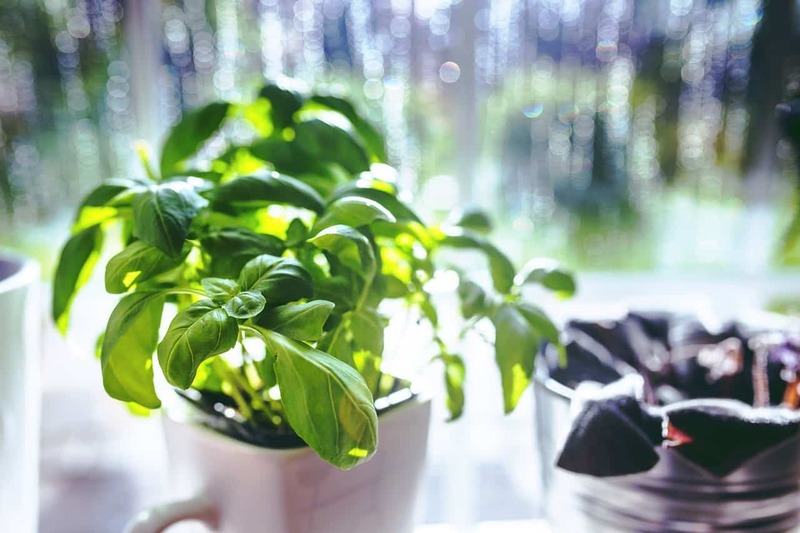 Basil plants need up to eight hours of natural sunlight a day to grow. The soil has to drain well but also keeps moist enough to hydrate the basil properly. The size of basil plants is Some are between 18 – 24 inches tall and 12 inches wide in diameter. Of course, there are also the baby versions of basil. They fit well in the containers. When growing basil, do not forget to place each of them slightly further away from each other. The much-needed space is between 10 – 12 inches. That will keep them from overshadowing each other as they grow. Dig the soil and work in organic materials. Remove every weed and turn the soil moist. Scatter the seeds before covering them with a ¼ inches of soil. When the seeds start forming some basil leaves, thin them out about one on every square foot. The great thing about basil plants is how easy it is to tuck them in containers or pots. For example, you can tuck purple basil into a mixed flower pot. Not only they look nice, but the colors are also so inviting and look edible. Use a premium quality potting soil. Feed the basil plant with fertilizer at least once a month. Never let the pot sit in the water. Pinch off the basil leaves when you want them to harvest some more. The pinching is the best trigger for them. When planting basil, mix it with some organic water about one foot deep. This will hold the moisture but still improving the drainage. It is all in balance. Try to water the plants regularly without getting the soil soggy. Avoid splashing the water onto the leaves. Rich soil usually does not need fertilizer, whether you plant basil or other types of plants. However, it will not hurt if you add some compost or compost tea. Use the mulch around the basil plant. Basil never likes any competitions with other plants but still need the moisture. Do not let your basil plant stress out because of the heat and the drought. Try to keep everything well-balanced. This includes pouring more water for it when the day feels hotter than usual. Never let your basil get too cold, not even with the slightest frost. Cover the plant more properly with row covers. Make sure you can also harvest it before the first frost. Aphids are green bugs that love hanging out by your plants. These small and soft-bodied insects can survive in almost any environment. They are also very quick to move around. Therefore, you need proper basil plant care on a regular basis. Once a month is enough. Besides spraying them with dormant horticultural oil in winter, you can also use catnip, mustard, garlic, and chives. You can even use alcohol to control aphids’ population. In some cases, the aphids’ population control can also be done by using alcohol. Well, as long as it is pure ethanol instead of anything with more additives. How to create an emulsion from alcohol? Add it to a soapy emulsion to be more effective. Just put it in a spray bottle. Combine it with five cups of water, two cups of alcohol, and one tablespoon of your regular liquid soap. Before you start using it, testing it first on the back of your hand. If their reaction is mild, then you are safe. Start by testing the small area. If it is safe, then you may proceed with growing basil.